Redding, CA, was next on our list, a visit with Jeanne’s brothers Dwayne and Dave. In our never-ending quest to come up with new destinations, Jeanne and I have somewhat decided to stay close to California for the Gladiator’s (Max, our grandson) birthday in November with the intention of taking him to Disneyland. So we headed up to Redding for a few days stay, again staying at the Winn-River Casino/Resort. 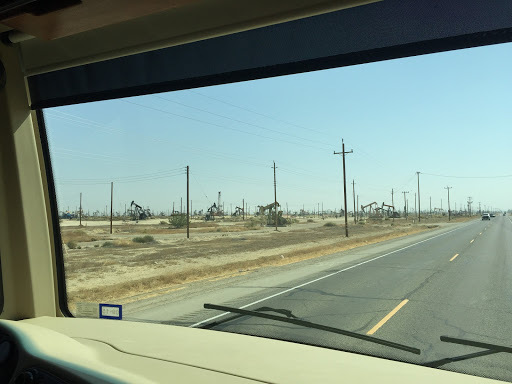 Thus began our extended California experience through the devastating western states’ wildfire season of 2015. We arrived in Anderson to smoke filled skies, barely able to see the sun at midday. A few days of good visit time with the boys and we floated south to Santa Rosa for a few days visit with Max & his family. We actually succeeded in tearing Max from the grasp of his mother and taking him shopping. Of course, no shopping trip with Max could ever be complete without the prerequisite stop at the playground inside the mall. The sun peeks at us at the Winn-River Casino campground. A dog’s life in this hectic world! Woody & Rags kicking it at Rags’ house in Anderson, CA. The Gladiator in his realm at the Coddingtown Mall, Santa Rosa, CA. 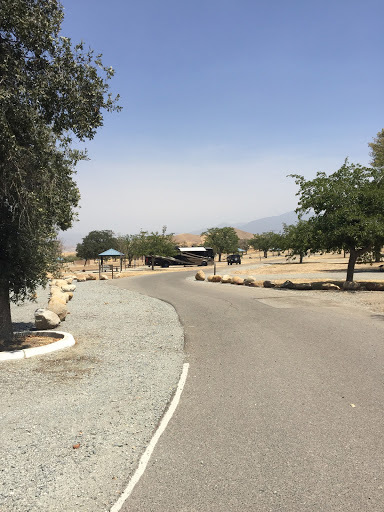 Our son Chad planned a family get-together at his place in Atascadero, with a family zip-line extravaganza, so from Santa Rosa we scooted further south and found the Vines RV Resort in Paso Robles to park the house at. Very nice RV park, well maintained, pools, spa, beer & wine tasting on site, the only “bad” is it is right on Hwy. 101, so traffic noise is constant. Jenn, Gus, and Max met us for the weekend at Chad’s house, and everybody, Max included, partook in the zip-line festivities. 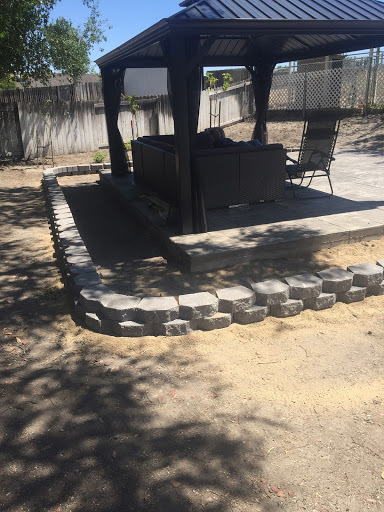 Chad also had a home project in the works, a patio gazebo and brick planter around the newly poured back patio, to which we offered our services and back muscles to. When we first arrived in the area, the smoke from the wildfires was not too bad, skies were actually still blue with smoke on the fringes. 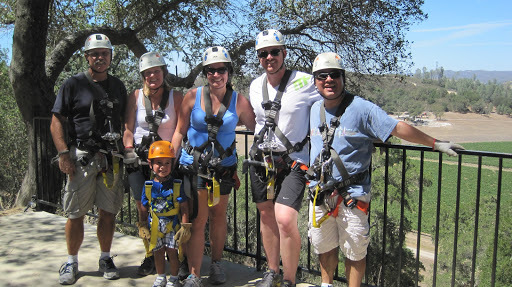 And luckily, we got our zip-lining at the Santa Margarita Ranch completed just in the nick of time. A few days later, the wildfires got out of control, and Chad actually heard the town of Santa Margarita had closed down due to fires. I hope the Santa Margarita Ranch survived, it was a nice day of zip-lining. The Flying Wallenda’s got nothing on us! And one brick planter box on the way. 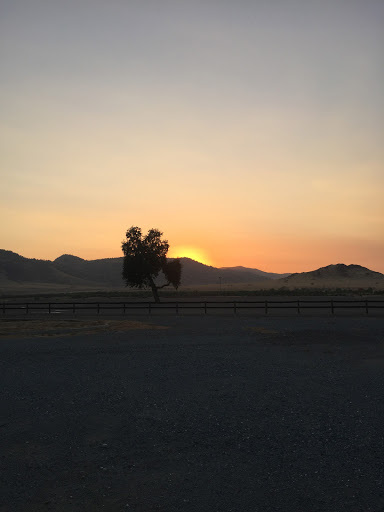 After 9 days in and around Atascadero, smoky skies darkening with each passing day, we decided to head over to the Porterville area to an Army Corps of Engineers campground at Success Lake. The drive there was not the most scenic and once we arrived we were unable to escape the smoke. This poor campground was as barren as one would expect in the middle of a most severe drought, and the lake was but a mere puddle. 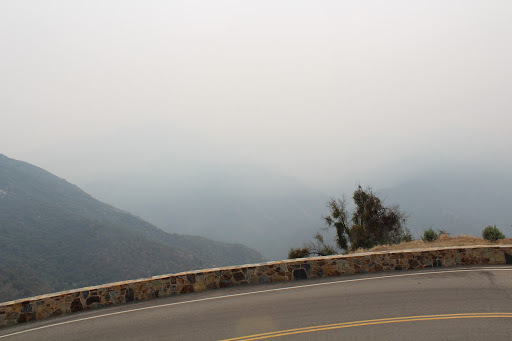 While staying here we drove up to the Sequoia’s Nat’l Forest to sightsee what we could in the thick smoke. 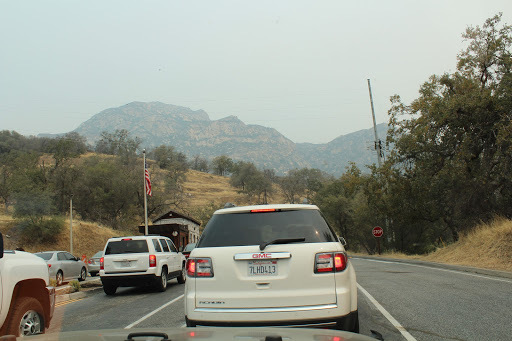 King’s Canyon Nat’l Park, at the northeast side of Sequoia’s, was closed at the time due to current wildfire activity, heavy around the Lake Hume area. 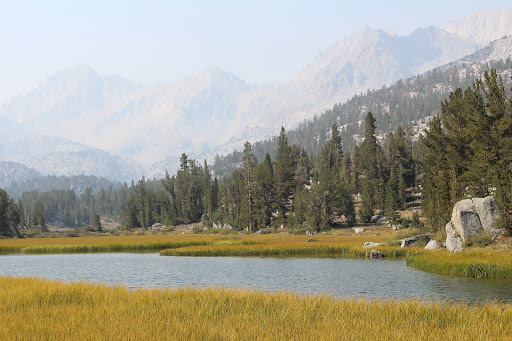 We were very disappointed in the Sequoia’s Nat’l Forest as far as Nat’l Parks go. There is heavy tourist traffic there and a lot of driving involved, similar to Yellowstone. But the “features” within the park have limited parking areas near them and most were full when we were there. The Parks do run free shuttle buses from some of the parking areas to the features, but that does not mitigate the inconvenience or lack of autonomy of parking near and walking to the things you wish to see. 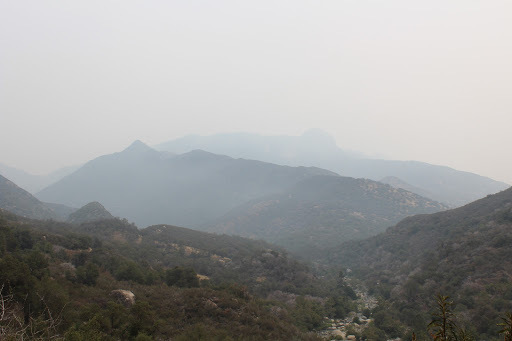 And of course the smoke was extremely thick making the normally scenic mountain views mostly obscured. Gate area into the Sequoias Nat’l Forest, complete with that lovely smoke ambience. Nice view of the mountains?!? NOT! 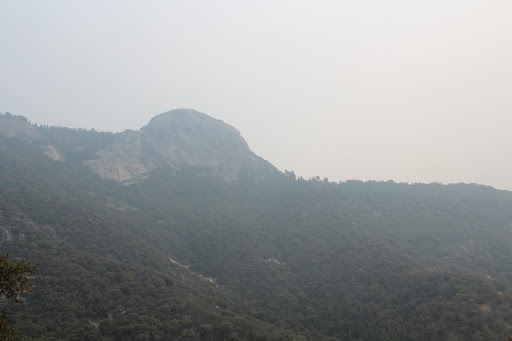 Moro Rock through the smoke and haze. …and the sun sets on our little stay at Success Lake. Trying to find some respite from the 100 degree temps we have been in for the past couple of weeks, we chose to head up into altitude to maybe escape the heat and possibly some of the heavier smoke. 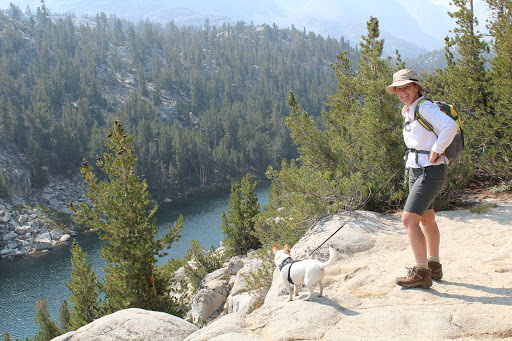 Mammoth Lakes became our destination, with a few day’s stop in Bishop on the way. We found the Tri-Counties Fairgrounds in Bishop with FHU and 50A service to use as our home for a few days. 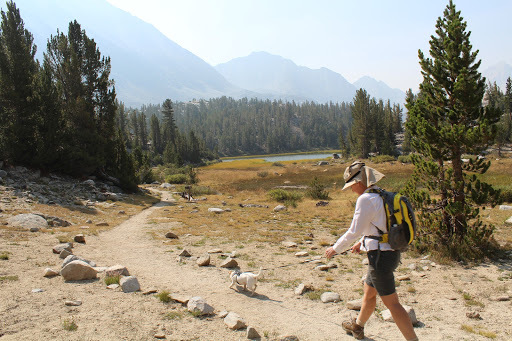 Smoke continued to plague us, but we toughed it out and took a 3-hour, round trip hike on the Little Lakes Valley trail just between Bishop and Mammoth Lakes. This would have been an absolutely beautiful scenic hike if it were not for the smoke. The trail winds among numerous lakes among the mountains and even with the smoke, it provided some pretty nice scenery. The trail is popular with the overnight camper/hikers/fishermen and you need to get a permit from the rangers for that back country camping. Hiking on the trail toward that next lake. Takin’ a break above Box Lake. …and another break at the side of Long Lake. Two recreational wanderers living the good life! Well, tomorrow is moving day again, off to Mammoth Lakes. Jeanne has found several possible sites for setting up residence, some paid and some boondocking. It sounds like we may be in the Mammoth Lakes area for a while, temps are supposed to be manageable. Oh boy!